Kent Oaks Consortium offers outstanding initial teaching training in a vibrant school environment. The consortium is accredited by the University of Sussex, and in partnership, we provide practical experience supported by sound pedagogy. With a balanced approach to practical teaching and theory you will acquire the skills to become a reflective and honest practitioner, and therefore, an outstanding teacher. Teacher training based in and delivered by schools provides the trainee with many benefits. From the start of term you are part of the whole school community and consortium. You will undertake an immersive daily school routine experience whilst working alongside like-minded people. Each trainee is supported by an in-school mentor as well as a link tutor; these are experienced teachers who can guide and focus on adapting the skills of the trainee. All primary and secondary schools within the consortium, including the lead school, Knole Academy, undergoes continuous quality assurance in order to provide rigorous training standards. Successful applicants have the opportunity to undertake their placements on a full or part-time basis with either route offering a PGCE and QTS. Upon qualification trainees usually take up teaching posts in their training school or within the consortium. Support with your UCAS Application 11 March 2019 @ 18:30 - This online event will provide advice on the UCAS application process. Professional Skills Tests 6th March 2019 @12:00. Speak to the online panel for how to prepare for you numeracy and literacy skills tests. Change Career to Teaching 18th Feb 2019 @ 6:30pm - Considering a changing career? Primary Teacher Training Options 13th Feb @ 12:00. Need some advice on all things primary teaching? 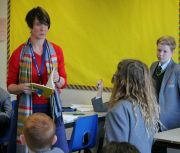 Introduction to Teacher Training Options 6th Feb 2019: Join this online event to find out more about teaching as a career! UCAS Teacher Training Videos Watch these videos to get an introduction into how to research and apply for training programmes. "Even though this year has brought many challenges, and at times I have had to ask for help, the advice and motivation which I have received from not only my mentor and fellow teachers, but also the senior management team, has been outstanding."